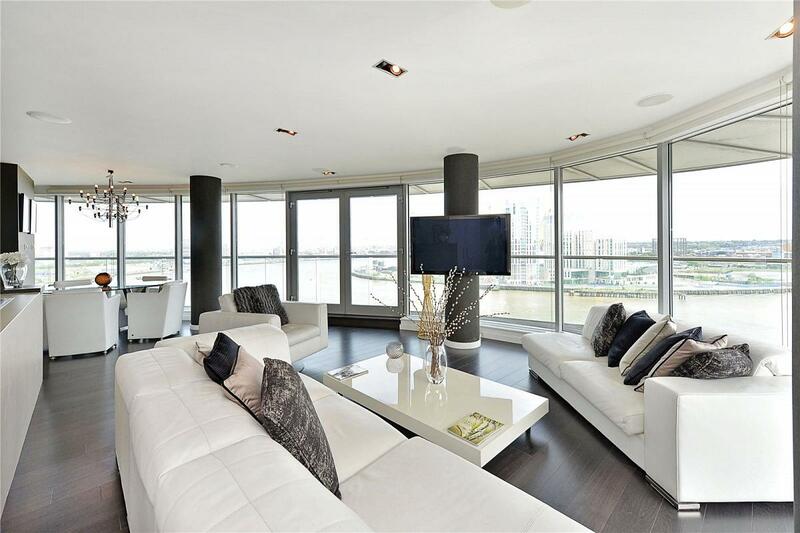 An exceptional 1660sq ft 13th floor 3 bedroom premier apartment with panoramic river views from all principal rooms. The apartment boasts a South-facing reception with floor-to-ceiling windows & a wrap-around balcony with glass balustrades. The combination of floor-to-ceiling windows & glass balustrades allows for unobstructed appreciation of the spectacular views of the River Thames & O2 Centre, as well as an abundance of natural light. The property has been refurbished throughout to a superior standard. Accommodation comprises: a spacious open-plan reception with fully-fitted kitchen; 3 double bedrooms (2 with en-suite bathrooms) with copious fitted wardrobe space; plus a guest bathroom. Additional benefits include plentiful storage, air-conditioning & an Opus AV system throughout the property. New Providence Wharf is a landmark development by Ballymore, completed in 2005; complemented by Ontario Tower & now Charrington Tower which completes the New Providence Wharf development. New Providence Wharf residents benefit from use of the brand new gym, 25 metre swimming pool, sauna & steam room in Charrington Tower, as well as 24 hour concierge & site security. Valet parking for 1 vehicle is included. "An exceptional 3 bedroom premier apartment with stunning river views"